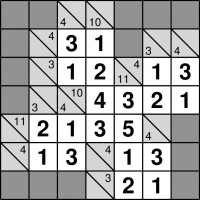 Kakuro puzzles, also known as Cross Sums, are a little like a numerical crossword. The aim is to fill every square with a digit in the range 1 to 9 while fulfilling all of the given clues - and without repeating a digit in the solution to any single clue. A standard Kakuro puzzle consists of a grid of squares, some of which are unshaded. When the puzzle is finished all of the unshaded squares must have a digit in, and each continuous horizontal or vertical run of empty squares adds up to the value given immediately to the left of it or the top of it respectively. Kakuro has one other rule: the same digit cannot be repeated within any run. You can, however, repeat a number elsewhere in the same row or column of the puzzle so long as there is at least one non-solution square between them - or in other words, so long as it is in the solution to a different clue. Look at the solved puzzle on the left. The solution to the '4' clue at the top-left is 3 and 1, which is fine since of course 3+1=4. It could not have been 2+2 because that would have repeated a digit in its solution, so we knew even from the empty puzzle start state that the solution to these two squares had to be 3 & 1 or 1 & 3. The secret to solving Kakuro is usually to look for the overlaps where two highly-constrained clues cross, such as where the '4' and '3' clues overlap in this puzzle. One must be 1 & 3, while the other must 1 & 2 - so the overlapping square they both share must contain the 1 since it is the only digit in common. Every Kakuro puzzle only ever has one possible solution, and it can always be reached via reasonable logical deduction. In other words, guessing is never required. Kakuro puzzles on puzzlemix appear at a wide range of sizes and difficulties, from 9x9 right up to 16x16, and they are not necessarily square in shape either. Are you searching for help with Kakuro puzzles? Stuck on solving Cross Sums? Don't know the instructions for Kakuro? Need Cross Sums instructions? Want solving hints and tips for Kakuro? Then puzzlemix is the place for you to play Kakuro puzzles online. Looking for printed Kakuro puzzles? Visit Sudoku Xtra for puzzle magazines and books. Or are you looking for a Kakuro puzzle supplier? If so then check out Any Puzzle Media, my puzzle production company.